The mount industry has finally warmed up to magnetic mounts. We first wrote about magnetic mounts a few years ago and we were puzzled why there weren’t a bunch available. The only ones that we knew of back then were from a company in Italy who charged quite a bit for these versus where the prices were for the non magnetic models. We were big fans of magnetic mounts because of the ease in installing and removing your device from your car. There’s nothing easier. Well since we first discovered our first magnetic mount, things have changed and the industry has really embraced the concept. Using a magnetic mount is easy. The typical parts that you receive are shown in the photo that accompanies this article. Almost all magnetic mounts consist of a mount with a magnet and an adhesive metal strip that attaches to the back of your device. The metal plate is larger than the magnet and you simply line it up when you mount it. These work well with GPS units that have a flat back. A few older models have rounded backs and I don’t think magnetic mounts are going to work well in these cases. The majority of magnetic mounts are marketed for cell phones. I have found that most magnetic mounts can handle up to about 8 ounces. That’s enough to handle most 5″ GPS units. Examples of weights would be a Garmin Nuvi 2539LMT which is a 5 inch diagonal screen GPS coming in at 6.5 ounces. A larger Nuvi 2639LMT which has a six-inch diagonal screen weighs 9.5 ounces. This doesn’t mean that you will not find a magnetic mount that will work with larger GPS units. It all depends upon the strength of the magnet and the size of the metal plate that will attach to the back of the GPS. The location of the mount is another consideration to take into account. You can place mounts almost anywhere in your car or truck. I find the best locations to be the windshield, dash or vent when using magnetic mounts. You want a place that’s near eye level and where you don’t need to take your eyes off the road to look at the GPS so these locations work well. The vent is another one of those mounts that has become really popular over the past few years. So let’s look at what’s out there. The Scosche MagicMount is an adhesive dash mount that includes several size metal strips that adhere to your device. Use the largest strip for your GPS and adhere it to the back. The mount includes a 3M adhesive strip to paste it onto the car dash. It features a swivel and pivot feature and is low in profile. If you don’t want to stick anything to your dash, that’s ok, this Scosche MagicMount Mat is a similar mount but includes a non skid base versus the adhesive. It’s quite a bit larger but you don’t need to worry about the adhesive. 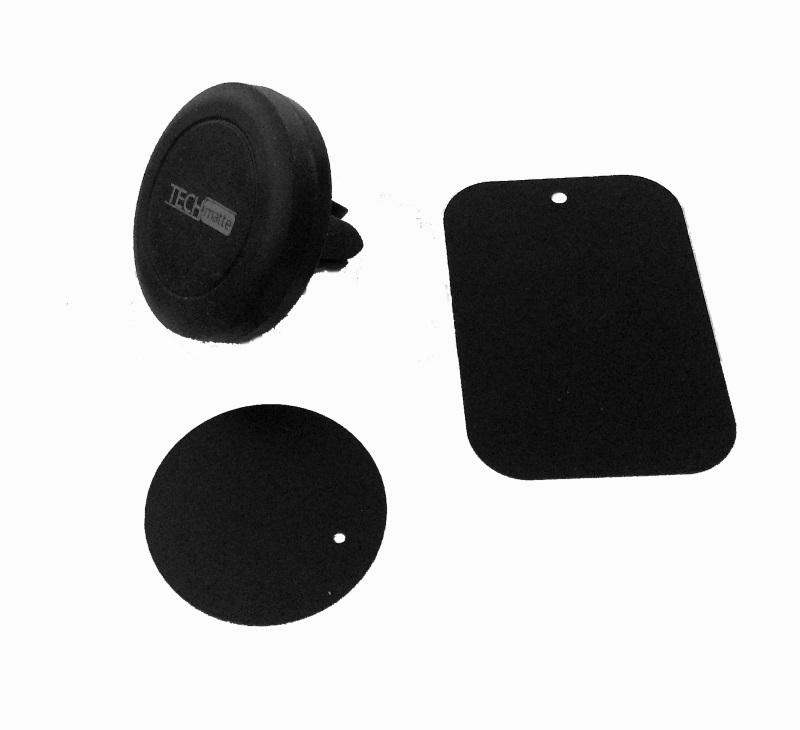 The TrekkerTech PhoneRider is a windshield suction cup mount that includes a strong magnet and adhesive metal strip. They actually claim that you can use these for tablets, so this might be one that can be used for larger GPS units as well. This is one of those mounts with a sticky bottom which means you can use it on your windshield or dash. As with any mount, never text or program your GPS while driving.